VASA, originally introduced in vSphere 5.0, are an extension of the vSphere Storage APIs. VASA is shorthand for vSphere Storage APIs for Storage Awareness. It initially allowed storage arrays to integrate with vCenter for management functionality via server-side plug-ins or Vendor Providers. The storage provider exists on either the storage array service processor or it may also be a standalone host – this is at the discretion of the vendor. 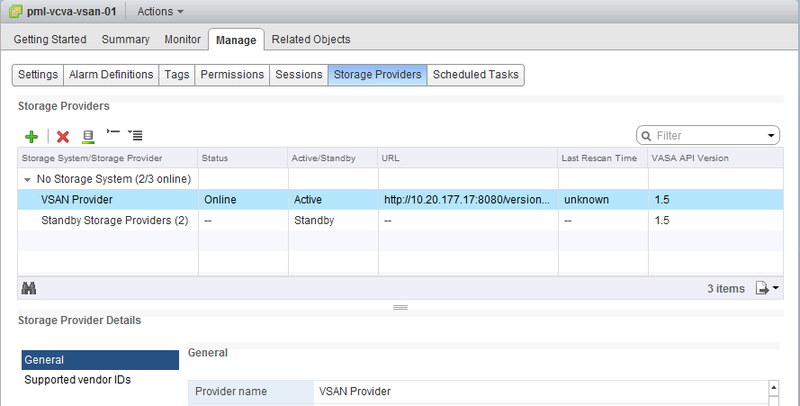 In the case of VSAN, it also uses VASA, but interestingly the storage provider is now placed on the ESXi host. Read on to learn more. 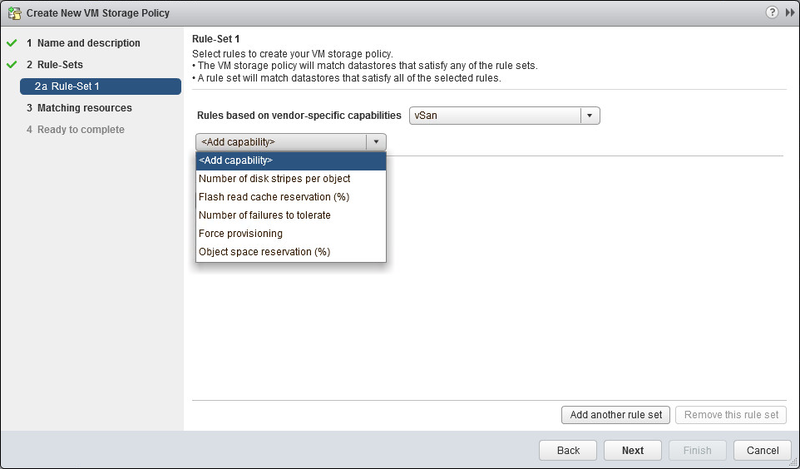 Initially the storage capabilities handled by VASA in vSphere 5.0 were very simplistic. There was a single capability associated with a LUN/datastore. In VSAN, there are multiple capabilities associated with the vsanDatastore. The capabilities surfaced up are more complex but also more intuitive.The storage provider is responsible for surfacing up a set of predefined capabilities. In the case of VSAN, each ESXi host can provide this information. In the initial release of VSAN, a subset of capabilities around availability, provisioning and performance will be surfaced up to vCenter. The capabilities can be viewed in various places in the vSphere web client, including the VSAN datastore. To verify that the storage provider is online, navigate to the vCenter server, select the Manage tab, and then select the storage provider. The Status should show Online and the Active/Standby state should show one VSAN Provider as Active. In the case of a host failure, a standby storage provide will assume the active state to enable the continuous surfacing up of the storage capabilities to vCenter. The following picture shows a VSAN cluster with 3 ESXi hosts. All hosts have a storage provider, but only one is active. The other two are in standby. Should the host that currently has the online storage provider fail, another host will bring its provider online. As mentioned, the VSAN Provider is responsible for surfacing up a set of underlying storage capabilities to vCenter from VSAN. In the initial release of VSAN 1.0, there are 5 capabilities surfaced, as shown below. These capabilities, and how they are used to create VM Storage Policies on VSAN, will be covered in much greater detail in a future post.